I like to be able to send effects tracks to one another, e.g. 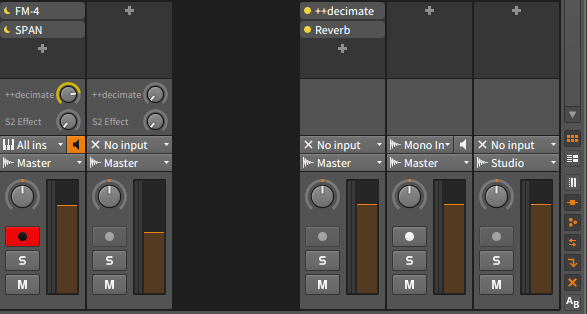 send a bit of delay to reverb or vice versa.. Cant see how to do this without adding to an effects chain? One workaround for this is to use the device audio receiver on an effect track. Not the best, the best would be just to be able to send effect tracks to effect tracks. But at the moment this is the best i can offer since i am not part of the bitwig team i can only bring work-arounds for situations like this. The audio receiver is a good workaround for now, the only problem is that it could become messy to remember where you're sending audio to. For example, if I have 20+ effects tracks with various sends hapenning via audio receivers, you can't quickly view at a glance exactly where you're sending audio, or how much (what percentage) you're sending. The only way you could know this is to check every effects track individually to see exactly how much you're sending - or receiving in the case of this workaround.. Thanks though, I have contacted the Bitwig team with this request. I was just about to suggest a workaround, but I can already send effects tracks to one another via the input/output routing button in the bottom left corner of the main window (it looks like two arrows facing different ways). What's the issue, exactly? Yeah, I figured it might not be quite what you were looking for. Apologies, I didn't want to sound like I was patronizing you. Currently I get around this by converting fx tracks to busses and sending them into whatever secondary fx from there, but again that's not what you're looking for - hopefully they'll add it soon? Still not available in version 1.3.9, I would really like this feature. Shouldn't be too hard to incorporate into the GUI, it's just blank space as is. They could leave out send amount into self to avoid feedback, or not if you get away with sending a tiny amount without total feedback chaos. How to tell if there is something in the FX nest of a device?